Why 2.25X4.25 Magnets May Never Disappoint You? The dimension 4.25×2.25 is not exactly a big size, but it is neither too small to miss an attention. You can position your business information or individual message over these customized magnets creatively to buy attention. You can harness the benefits of free full color printing offered by many reputed online stores stocking personalized magnets. You can stay assured that although they are small, but not tiniest or the miniscule of the lot. That is true. Consider following situations – you are considering advertising on television, radio, through banners or announcements. Of course, one similarity is that they are expensive and the next is they have their own set of rules, which you have to admit in order to work on them. However, magnet advertising never exposes you to such situation. You feel like the sole owner of the campaign. Because most reputed online stores, whom you approach will allow you to stick with information, which you always wished to share. This means you don’t have to give up to the tantrums of studio bosses, radio jockeys for spreading a word about your business. Doesn’t that thought of a sole owner of campaign tickle your imagination! Be aware, there are also online magnet stores, which offer you pre-set designs in various stock sizes. Whether you buy a 2.25 x4.25 magnet or a 10×8 magnet, the savings are always high. Most online stores allow you to save on full color printing, online design proof, shipping, and art setup because their prices are included. 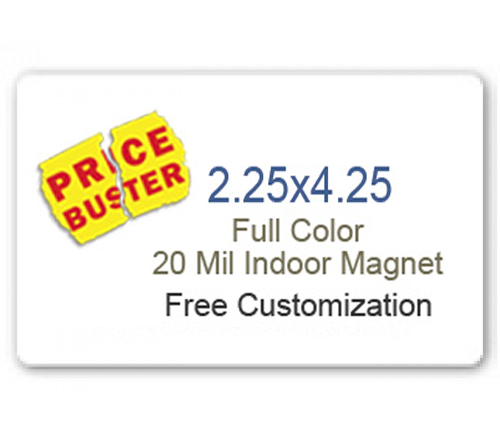 Many of these customized magnet stores also offer best buy pricing on bulk ordering. Savings, savings, savings, and huge savings are the only thing you can expect. There is also savings in the form of effort to carry these customized magnets. Being made of high quality and lightweight material, you can easily transport them to the happening places such as tradeshows, corporate events, etc. The biggest quality of magnet advertising is that it leaves no room for discrimination. Now you may ask whether other advertising techniques are tainted with discrimination. No! They may not be bugged by any discrimination in such but they are always labeled as a rich man’s indulgence. However, a customized magnet largely remains affordable to everyone and anyone who wishes to use them. If you are buying form a reputed online store, you can avail 4.25×2.25 magnets in different stock sizes. Perhaps you would agree on these 4 reasons why 2.25 x4.25 magnet may never disappoint you.